Condé sur Noireau is a large and bustling market town that lies in the north of France, in the Calvados department of Lower Normandy. Easily accessible from the UK thanks to its proximity to the ferry ports, the town makes a great base for further exploration of this fascinating and historic area. Well, maybe not in the air, but there is certainly a castle worth visiting at Condé sur Noireau. The Pontecoulant Castle, which sits in a delightfully pretty tree-laden lakeside setting, is an architecturally stunning building, as well as being historically important. It adds a distinctly distinguished air to Condé sur Noireau. It also houses a renowned furniture collection. Condé sur Noireau is a market town, and in France that always means something special. The general market that is held in the town every Thursday is a great place to buy your fresh locally grown fruit and veg, to taste and discover local cheeses and ciders, to meet and chat with friends old and new, and to relax at a pretty pavement café and watch the world happen around you. Perfect days! Condé sur Noireau has some super shops and restaurants, so you will want for nothing. There are all then usual facilities such as banks, schools, heath services etc. There is a cinema too, although you may have to brush up on your French language skills if you are to understand most of the films! If you enjoy being outdoors (and it is such an integral part of French life in the summer months) then you will love the area around Condé sur Noireau. There are lots and lots of sporting activities, starting with the superb swimming pool and ten-acre park with a fitness circuit at the Espace Aquatique. This is not just a swimming pool, but a complete water park with a giant slide, three individual pools, fountains and fun all the way for all the family. Then there is horse-riding, canoeing and kayaking, walking, cycling, rock climbing and mini golf, to name but a few of the options that are available within the region. Condé sur Noireau lies in an area of Normandy that is known as Swiss Normandy, and this means that there is lots of beautiful countryside to explore. You are also close to the historic beaches of the Normandy Landings and the battles of the World Wars, so if you want to remember those who fought then you can pay a visit and live a little history. The beaches are beautiful in their own right too, not just as historical monuments, so when the sun shines take a towel and pack that bucket and spade and head for the beach. There are lots of lovely and interesting towns and villages to discover in the area. Try Avranches, with its shops, museums and markets, or treat yourself to a day at the seaside at the beautiful resort of Mont St Michel. It is always easy to access towns in Normandy, as the ferry ports are so close by, particularly Le Havre, Caen (Ouistreham) and Cherbourg. There are also airports at Dinard, Rennes and of course in Paris, but the ferry or the tunnel trains are probably the better options for those wishing to travel from the UK. Should flying be your preferred method of transport, however, then Dinard is served by Aurigny and Ryanair, Rennes by Flybe and Paris by a multitude of airlines. Normandy in general can be a good place to seek property in northern France, as it tends to be a little cheaper than Brittany, where foreigners have pushed house prices up in recent years. Recent investment in Normandy has improved the region too, and there are some excellent properties on the market. Look for the characterful traditional Swiss Normandy cottages, or stone built village houses which can sometimes be found at bargain prices if you are lucky. Do you know Condé sur Noireau better than we do? Do you have photos of Condé sur Noireau? WHERE IS Condé sur Noireau? Condé sur Noireau is located in the far north of France, on the coast just south-west of Calais. 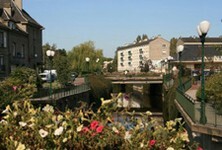 It lies in the south of the Calvados department, on the border with the Orne. Access: By boat: The town is easily accessed from any of the northern ferry ports, especially Le Havre, Caen (Ouistreham) and Cherbourg. By rail: The nearest railway station is found 37 km away, at Vire. By air: Fly to Dinard, Rennes or Paris. Economy: The economy is varied and thriving, with commerce and industry of equal importance. Tourism also figures. 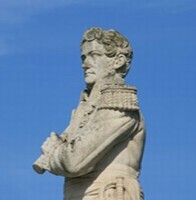 Interesting fact: Cesar Dumont d'Urville, a sailor credited with bringing the Venus de Milo to France, was born in the town.